Indicates the link goes to another Iseehear owned website or an Iseehear authorized website. Please go to the SoftMouse DB Registration Page and fill in the Registration Form. If you require some coaching on Getting started with entering Colony or Breeding Data into SoftMouse then please visit: How To Begin Tutorial. If you would like to import your mouse colony data from a spreadsheet or from an existing mouse colony database application and upgrade into SoftMouseDB Mouse Colony Management Database please Contact Us or read additional Simple Data Import information Here. Have you registered for the SoftMouse 30 Day FREE Trial? If not please Register Here . Have you subscribed to the SoftMouseDB? If not please Register Here . Please refresh the login access page then re-enter your username, password. Please check that you are logging in with your correct user name and password. If unsure please contact your lab account administrator or your SoftMouse Representative. If you have 3 unsuccessful attempted logins on your forth attempts the Security Code requirement will appear. The email address that you provided to us upon your registration. The full name that you provided to us upon your registration. "Forgot my password" as your email subject line. Simply click the button that says "Start FREE" or "Create an Account" or "Register". Fill in your account form. 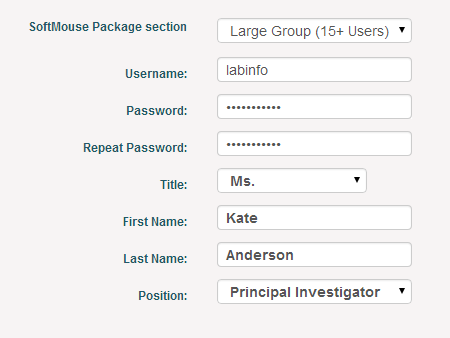 Click submit and start entering data into your personal SoftMouse account. Emergency Upgrades or Emergency System Maintenance Procedures are unscheduled procedures performed in order to keep the Iseehear systems and services performing at first in class service levels. Subscribers will receive an emergency maintenance email notice informing of the unscheduled event. Iseehear will keep you informed of our progress and estimated time to resumption of affected systems and services. To learn more about "What are Emergency Circumstances?" Click Here. To learn more about Disaster Recovery & Research Continuity Click Here.